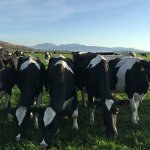 Nothing average about Pasture Promise free range milk. We have now launched formal membership of the Free Range Dairy Network for farmers and we are also giving others who want to be able to choose milk from cows in fields the chance to support us. The recent farmer survey has produced some really interesting results, which provide a useful insight into how dairy farmers see their businesses today and their thoughts on the way ahead in an ever-changing world.